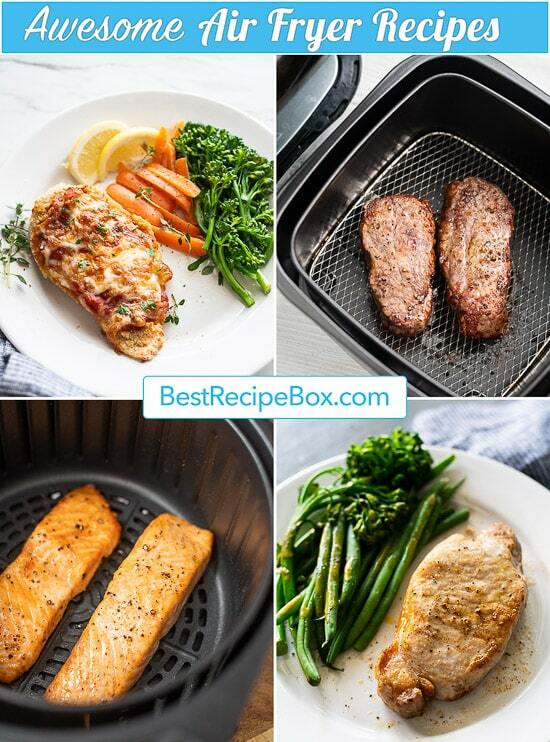 Buy our –> Air fryer eCookbooks here! Breakfast of air fried baked eggs in the air fryer doesn’t get easier than this! Brunch is even more perfect and easy. 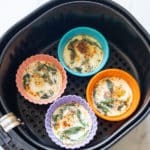 If you’ve never had these low carb baked eggs in the air fryer, you’ll going to wonder why you make them earlier. It’s so simple to make these low carb baked eggs. You can just cook eggs, or add some milk, cream, bacon, sausage, spinach, cheese or what ever your heart desires. 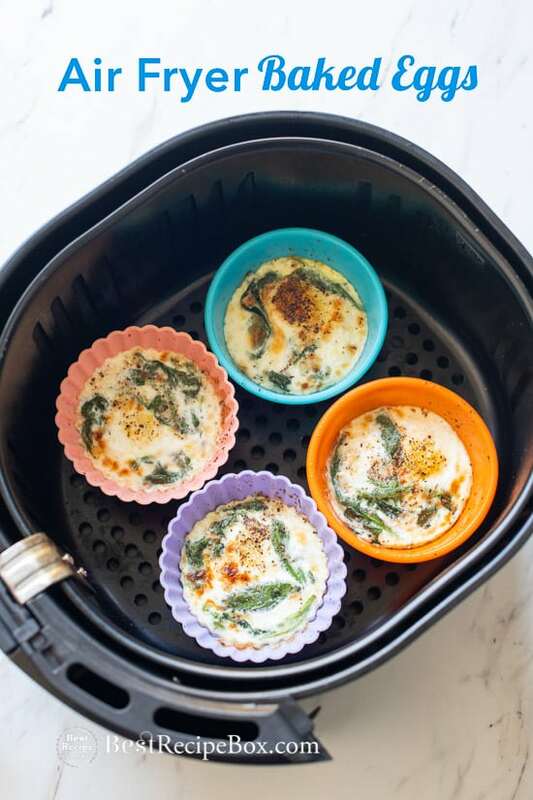 There’s so many possibilities to these air fryer baked eggs, you’ll have so much fun eating them. And best of all, they’re absolutely perfect for brunch! Spray inside of silicone muffin cups or ramekin with oil spray. 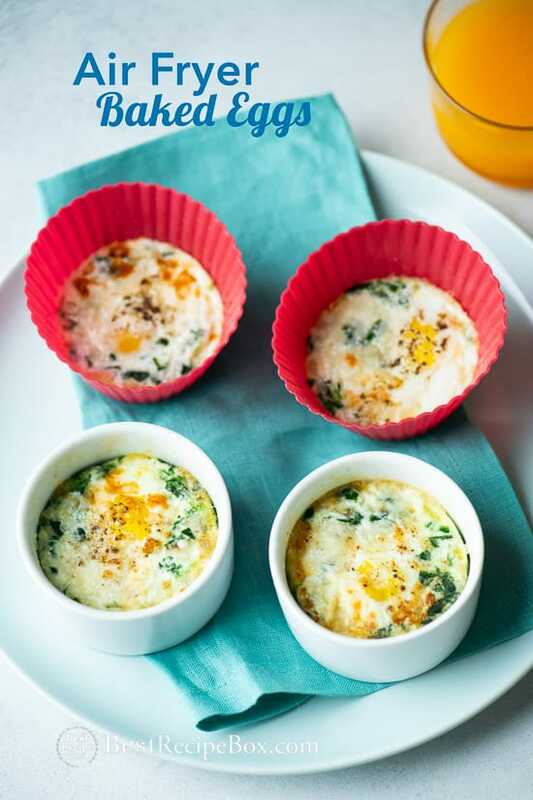 Add egg, milk, spinach and cheese into the muffin cup or ramekin. Season with salt and pepper. Gently stir ingredients into egg whites without breaking the yolk. More recipe details in recipe box below. What Container to Cook Air Fryer Baked Eggs or Egg Muffin Cups? 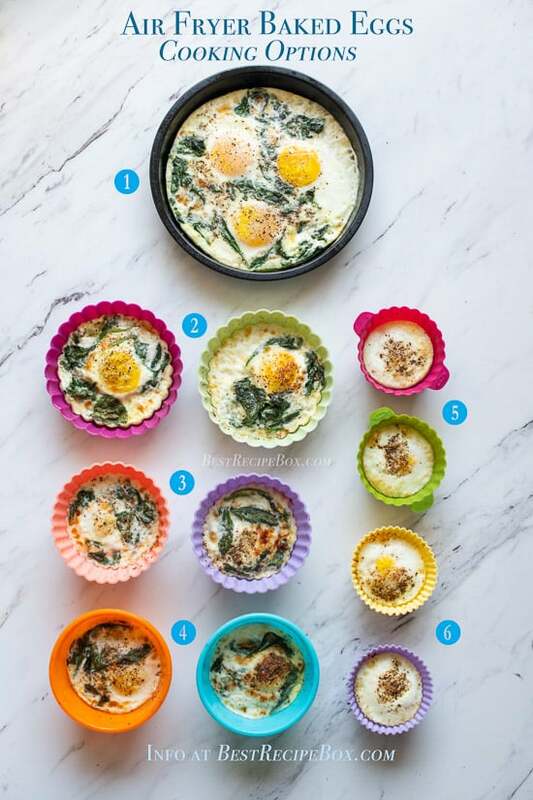 There’s several options to making air fried baked eggs or egg muffin cups. We like to use the silicone muffin cups for single servings. It’s a great way to personalize each persons baked egg serving. These silicone muffin cups are easy to use and with some olive oil spray, the egg doesn’t stick. For multiple servings, there’s the tart silicone cups or the smaller pie/cake tins that come with the air fryer accessories. Pizza pan from the 3.7qt. – 5.3qt Accessory Set (6 pieces) – This very versatile little pan can serve up to 4 large eggs. The low pan allows the eggs to cook quicker too. Wilton Mini Silicone Tart Molds- Small and perfect for one large egg per mold. Ideal for multiple single-egg servings. If you’re wanting to add milk and other ingredients, these might be too small. Large Bakerpan Smooth Sided Silicone Baking Cups- Same as the Jumbo sized silicone cups, except these don’t look like muffin cups. They have straight edges for easier cleaning. Standard Size OXO Silicone Baking Cup- These are awesome because they have little handles for easier holding. But they only come in small sizes, so ideal for single egg servings. Standard Sized Silicone Baking Muffin Shaped Cups- Adorable and great for single egg servings. How Many Muffin Cups Fit in Air Fryer? 3 qt – NuWave Air Fryer basket fits 4 Standard Size OXO Silicone Baking Cup perfectly without touching. Can also fit 2-3 small ceramic dishes, depending on the thickness of the ceramic dish walls. 4.2 qt – TidyLife Air Fryer basket fits 2-3 small ceramic dishes, depending on the thickness of the ceramic dish walls. Also fits 3 standard size baking cups without touching. 5.8 qt – Go Wise Air Fryer basket fits 4 Jumbo Sized Silicone Baking Muffin Shaped Cups without touching. 5.8 qt- Go Wise Air Fryer bakset fits 2 Wilton Mini Silicone Tart Molds without touching. 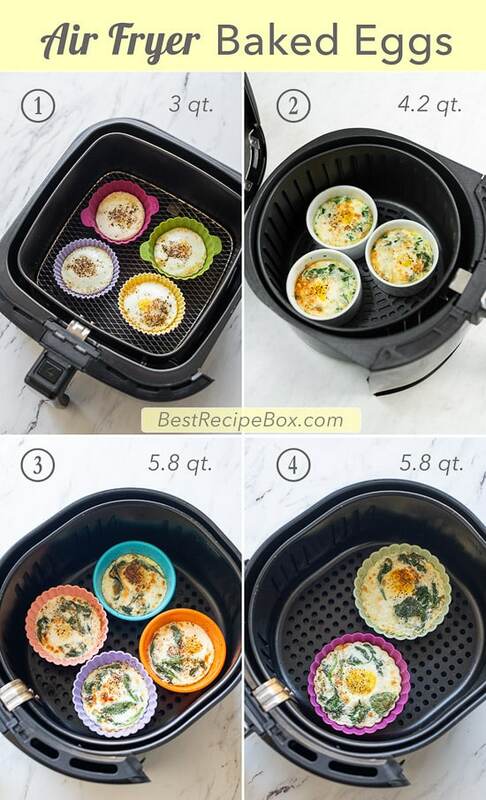 Below: If you’re using the shallow baking pan that’s usually part of the Air Fryer accessories kit, here’s our tip for getting it out of the air fryer basket (photo collage below). What are the Best Air Fryers? Cosori 3.7 qt. 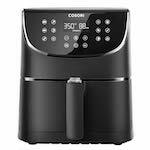 Digital Air Fryer – “That’s a stylish Air Fryer” was said as we unboxed the Cosori. Beyond being stylish, it has cooked great. The basket is not as tall and wider than most in its size group, which is perfect. You’ll have a lot better results in an air fryer with single layered, spread out foods, then with ones piled high and thick. The non-stick basket style (non-wire base) & smoothness of the basket tray is also great for clean up. Tidylife 4.2 qt. 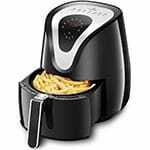 Digital Air Fryer – We have been super pleased with the TidyLife Air Fryer. Texture for several dishes came out noticeably better than many other brands. This one tends to cook a little hotter and quicker. The non-stick basket style (non-wire base) & smoothness of the basket tray is great for cleaning up. Tiluxury 5.8 qt. 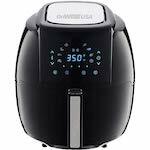 Digital Air Fryer – It’s a good larger air fryer capable of cooking for larger families, especially when you need to cook more food. It’s great for cooking bigger batches (ie 4 salmon fillets instead of 2 or 2 lbs of fries instead of 1). We like that this Tiluxury 5.8 qt has the non-stick basket (non-wire base). Makes for less sticking for delicate meals (ie baked fish fillets). And we like the digital interface (easier cleaning). GoWise 5.8 qt. 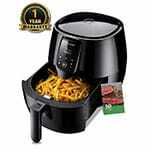 Digital Air Fryer – Another good larger air fryer. All the things we loved about the Tiluxury 5.8 qt, we love about this one too. Great size for families. Non-stick basket. Has a nice cooking range (180°F-400°F). We’re super pleased with both this one and the Tiluxury. Choosing between the two is mostly up to which you like the look better. The recipe is written based off of one egg, but you can cook as many in a batch that your air fryer will fit without squishing the baking vessels. If cooking multiple cups at a time, it may take additional time. Or if you're making a 2 eggs in one jumbo sized muffin cup, add an additional 2-4 minutes. Cooking in a ceramic ramekin may take a little longer. If you want runny yolks, cook for less time. Keep checking the eggs after 5 minutes to ensure the egg is to your preferred texture. Recipes were cooked in 3-4 qt air fryers. If using a larger air fryer, the recipe might cook quicker so adjust cooking time. Recipe timing is based off of NOT pre-heating before cooking. If you pre-heat beforehand, or are cooking in multiple batches, reduce the time for cooking for the pre-heated or subsequent batches. Thanks so much for actually showing how many muffin cups/ramekins fit into the different air fryers. This has been so helpful. It took us a while to write and research all this, so we’re happy that it was helpful to you! 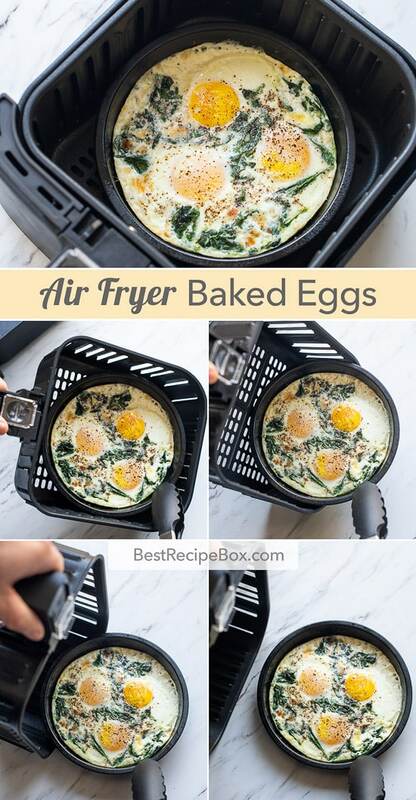 What an awesome idea to cook eggs in the air fryer! I’m having loads of fun at all the different stuffings I can put into this.